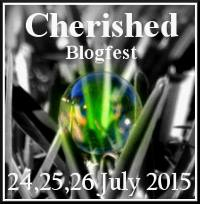 This Cherished Blogfest 2015, scheduled on July 24th to 26th, was organized for all Bloggers in Blogosphere to share memories, emotions, and information. What better way to read and comment on each other’s posts, get to know each other better, or make new virtual friendships. 1. Tell what our One Cherished Object is. 2. Post a picture of it if we like. 3. Tell why we cherish it. 4. Accomplish this below 500 words. The published blog would be our introduction link to other bloggers. Then we’d have time to go blog-visiting on the three days of the fest. The CHERISHED Blogfest hosts who organized all of this for us: Dan Antion, Damyanti Biswas, Paul Ruddock, Peter Nena, Sharukh Bamboat. I’d say, let’s raise a virtual glass of wine (Californian, Greek, Spanish, Italian, South American, and all other blogosphere wine countries of the world), and thank our hosts for their hard work in creating this Cherished Blogfest to connect the worldwide community! Significant Other thought I should choose “my old brain,” it’s gotten me this far without a lapse, gap, or missing parts. At this age it could be considered cherished, but not much fun to read about. Then I’d considered some close to cherished, long gone Treasured Objects – antique furniture, Italian artifacts, and abstract paintings. I know that’s a long shot! Anyway, a cherished object is at a much higher meaning level entirely. Cherished means to hold dear, feel or show affection for. An Object is something that when viewed stirs a particular emotion. Treasured means to collect and store up (something of value) for future use! So what’s long gone doesn’t fit. I had to include some thing(s) treasured because as a close tie to the cherished object, it fit perfectly. It’s a surprise at the end of this post. Think Before Sundown Welcome Page, mosaic tile! But! Wait! Don’t go there yet! In the end, this was a no-brainer, thinking like the Mom I’ll always be, no matter how old my “kids” are. The Cherished Object is small and flat. I can hold in my hand, put it in my purse or pocket, or use as a bookmark, and take it wherever I go. It’s red, white and blue, and two smiling little boys proudly stand in the middle. 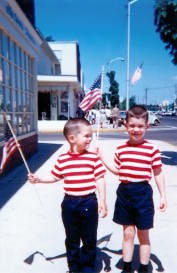 Yep, it’s a photograph of my two sons, Ted & Jeff, flying their American flags on the 4th of July years ago, when they were very young, and usually dressed alike. This cherished photo I hold dear and love. It stirs up happy memories, and a few tears! This entry was posted in Family, My Blog, My Entries and tagged Cherished Object, Connect the Blogosphere community, Go blog-visiting for three days, Join the fun, No-brainer for a Mom, Share memories and emotions, Thank and Cheers to Our Hosts, The Cherished Blogfest 2015, The Cherished Photo, The hold dear and love object, The treasured family gallery. Bookmark the permalink. Absolutely precious!!! I started laughing out loud when the number of dogs seemed to exceed the number of humans 😀. Such a beautiful family through and through. Thank you for sharing. I love your red, white & blue legendary photo with striped shirts, flying flags and beautiful shadow images behind your boys. What a joyful post, Christine. Must agree with Sammy D……I don’t think I’ve ever seen a more “joyful” post! Definitely a treasure to cherish this family of yours! I like the comment, “as far as anyone knows, we are a happy normal family” Every family has bumps in the road but not any that should be shared with the world. Nice post. What a fun post, Christine! I love that you included a whole gallery. I especially like the old photo of your sons — truly one to cherish. Mega hugs! So much happiness and good memories bursting out of this post, thank you for sharing all these gorgeous pictures of your family! Thank you also for taking part in the Cherished blogfest! Thanks for sharing your beautiful family with us Christine! Love it! Thank you Christine for participating and for sharing these lovely images. It took me back to my childhood seeing those two boys with American flags. I never really bought Indian flags, not that I do not respect my country, but I don’t want to seem them lying around once the Independence Day passes over and I get back in my busy academic schedule. I don’t have a lot of images of my childhood because camera was too expensive back then, but I can certainly share some moments every now and then to make you feel as if you were there. 🙂 Thank you once again for cheering all the hosts. I really love this. I am also impressed your husband thinks you have a brain. My husband did too, and wants me to solve problems, but still think he suspects I don’t have much of a brain! This is such a nice way to introduce your family to all of us. It’s funny how I noticed a smile on my face as I got to the end. It’s interesting, people we have never met add value to our lives even if the only thing they contribute is a smile we wear on our faces.Thank you for this lovely post. Absolutely. We miss those people no longer living with us (in body) but are blessed to have the thoughts and feelings for them remain in our hearts and minds for all eternity.